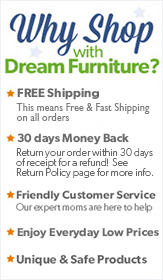 At DreamFurniture.com we are confident you will be happy and satisfied with your purchase. We stand behind our products and services. If for any reason you are not satisfied with your purchase, we will assist with a prompt return and refund the amount of your purchase excluding shipping charges for outbound and inbound. We do NOT charge RESTOCKING FEES**, excluding Custom and Special order items.! ** Custom and Special Orders - NO returns and refunds will be provided for Custom and Special order items. 30 days money back guarantee, excluding Custom and Special order items. You may return your purchase for any reason within 30 days of receipt for an exchange or a refund of the merchandise value. In order to properly return the item, it must be in new and unused and securely packaged inside its original packaging. Unfortunately, we cannot accept returns of products that have been assembled or modified. Returns will be sent to the location where originaly it shipped from. We cannot accept the returns of any mattress or bedding for hygiene reasons. Please login to your account and click on my account. Find your order number and click on details. At the bottom of the page you will find RMA request. Please fill out all informaiton and submit. Once we receive your request we will process the return order and email you RMA # with instructions. Please make sure you print the document and place the document in each box you are returning. Once we receive the returned merchandise, we will refund your purchase. Did the order or item arrive damaged? Our products are well-packaged to withstand damage during shipping. We double-box many items and we refuse to carry products that are easily damaged during shipping. If an item looks damaged or if parts are missing, you may order replacement parts by email [email protected] We will make every effort to help you obtain the necessary replacements as quickly as possible at no extra cost to you. If you have already accepted the package and find that parts are missing or damaged, please contact us right away and we will ship to you the replacement parts free of charge. If a product arrives damaged, or we made an error, and it cannot be remedied with either a full replacement or replacement parts, we will pay the shipping costs to return the item to our warehouse. If your item is problematic due to a manufacturer's defect, we can either replace the defective part, or if necessary, the entire unit.